On 24th January 2019, H.E. 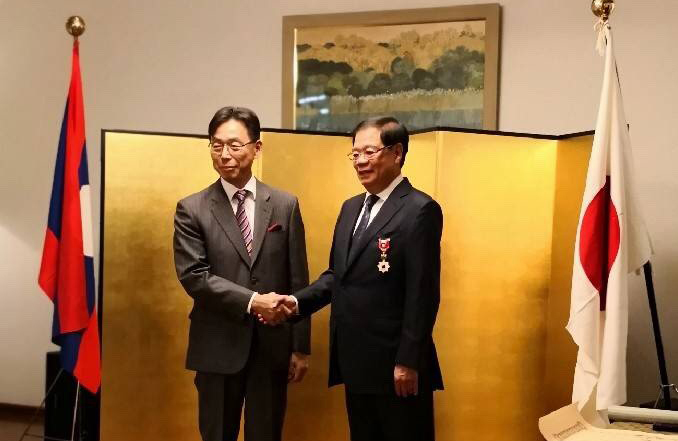 Ambassador Takeshi HIKIHARA of Japan Embassy in the Lao PDR, presented honorable award of The Order of Rising Sun, Gold Rays with Rosette or 旭日小綬章 in Japanese to Mr. Khemsath Philaphandeth, the President of Lao Toyota Service Co., Ltd., President of KP Co.,Ltd, and President of the Lao Judo Federation, in recognition of his significant contribution to strengthening cultural and economic exchange between Lao PDR and Japan. As well as promoting Judo in Lao PDR, the Lao Japan Budo Centre has been established and this valuable contribution achievably motivated national athletes to win many medals to the enhancement of the country’s reputation.